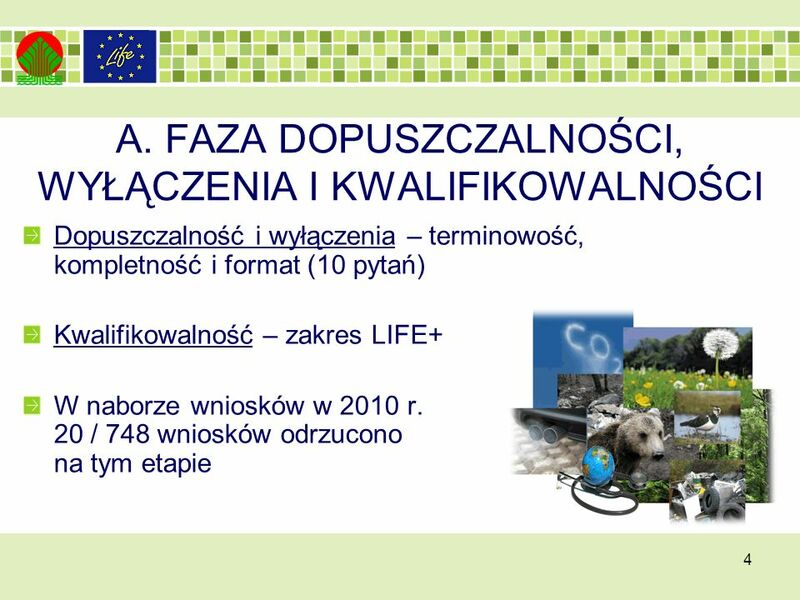 Dopuszczalność i wyłączenia – terminowość, kompletność i format (10 pytań) Kwalifikowalność – zakres LIFE+ W naborze wniosków w 2010 r / 748 wniosków odrzucono na tym etapie Points to make during the Presentation: The first stage in the Selection Process is the Admissibility, Exclusion and Eligibility stage. Admissibility: The Commission will check all proposals submitted by the deadline for completeness and format (proper forms used, properly filled in, none missing, etc.). 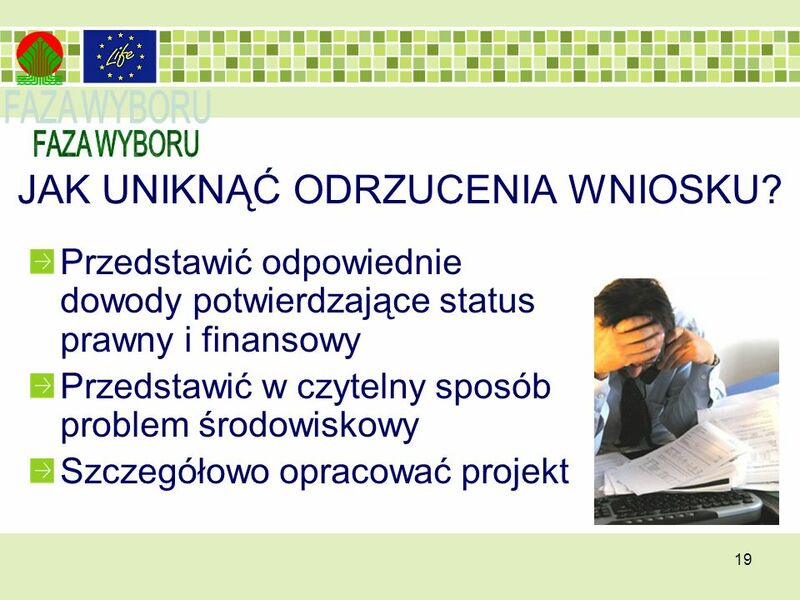 Proposals may be rejected right away (for instance, if two or more obligatory forms are missing). 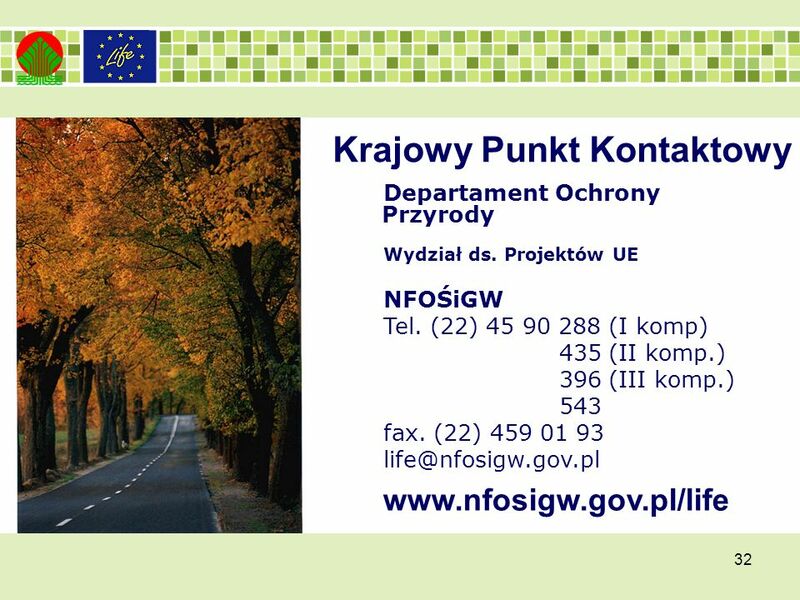 Or – in some specific cases – the Commission may contact applicants for missing information. For more details, refer to the Evaluation Guide. 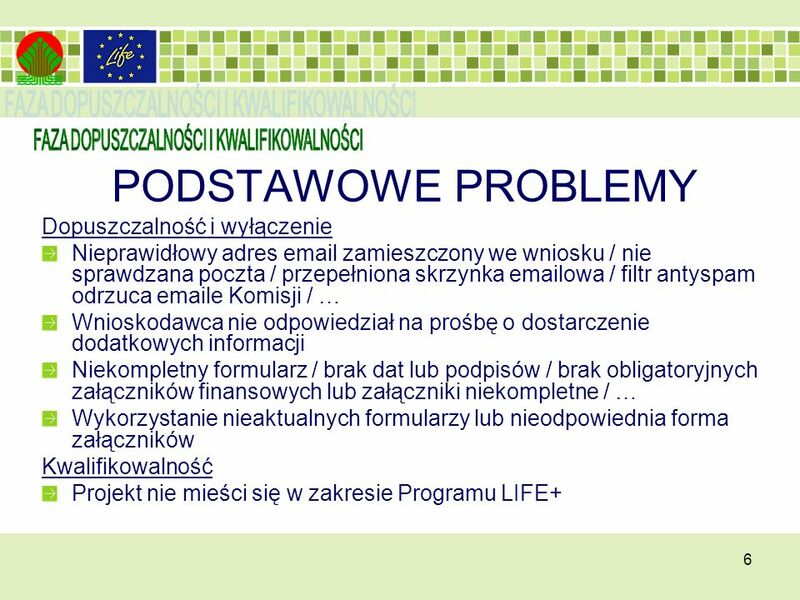 Eligibility: Proposals will also be checked for their general eligibility for the LIFE+ Programme, for instance whether they are on EU territory and fall within the scope of LIFE+. To ensure fairness to all applicants the Commission applies the rules and criteria strictly. Too many proposals are needlessly rejected at this stage for problems that could be avoided. From the 2007 Call, 17% were rejected at this early stage, often for mistakes that could have been avoided. The national authority may also carry out an admissibility and/or eligibilty check before submitting proposals to the Commission. Additional points: Background information: Evaluation Guide pp. 4 – 6. Detailed questions: Evaluation Guide p. 22. 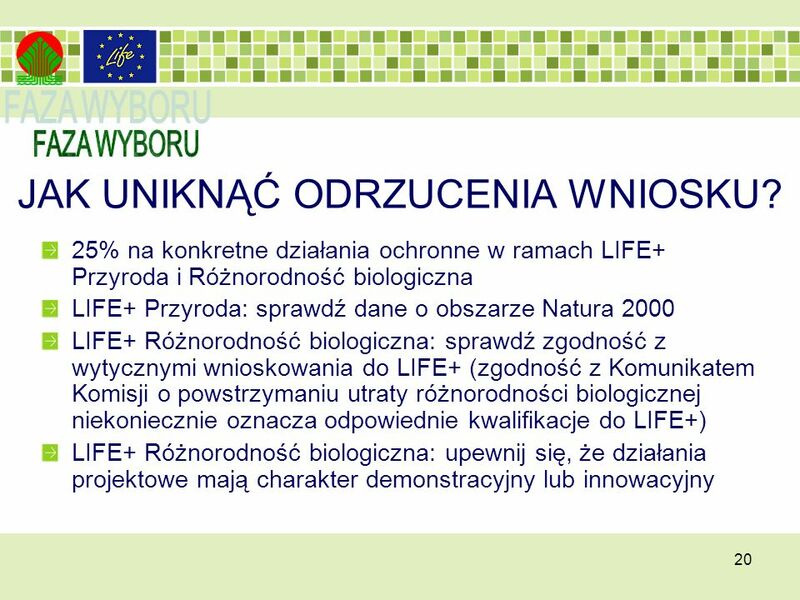 Checklist: Guidelines for Applicants (LIFE+ Information and Communication) Section 7 (LIFE+ Environment Policy and Governance) Section 7 and (LIFE+ Nature and Biodiversity) Section 6. 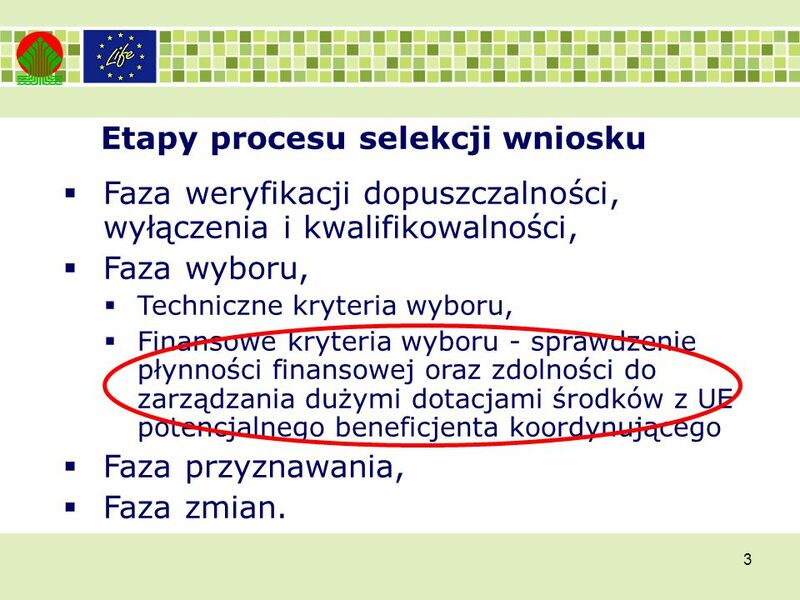 7 JAK UNIKNĄĆ ODRZUCENIA WNIOSKU? 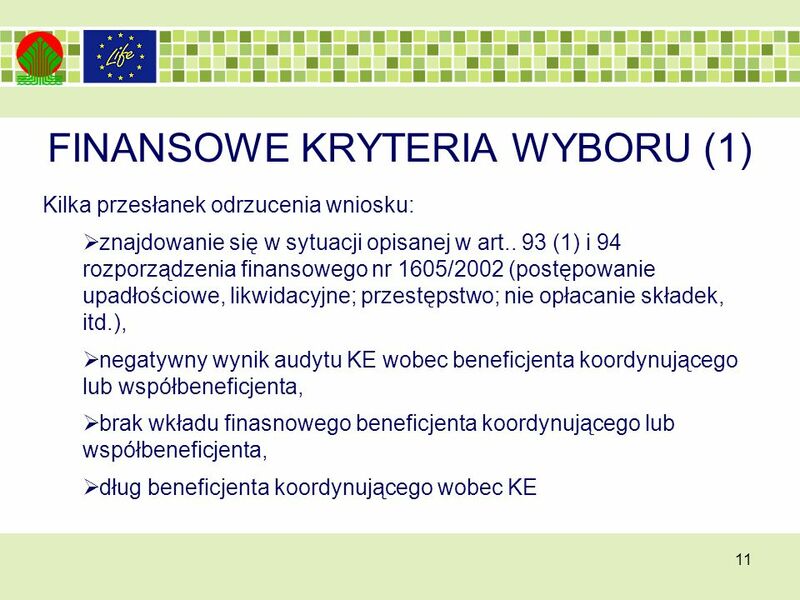 8 JAK UNIKNĄĆ ODRZUCENIA WNIOSKU? 19 JAK UNIKNĄĆ ODRZUCENIA WNIOSKU? 20 JAK UNIKNĄĆ ODRZUCENIA WNIOSKU? 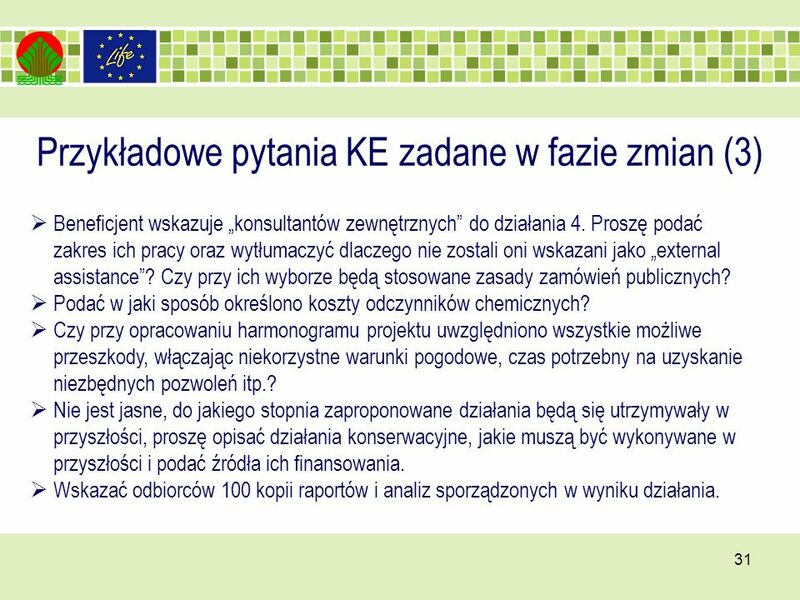 21 C. FAZA PRZYZNAWANIA Kryteria Punkty maksymalne Próg min. 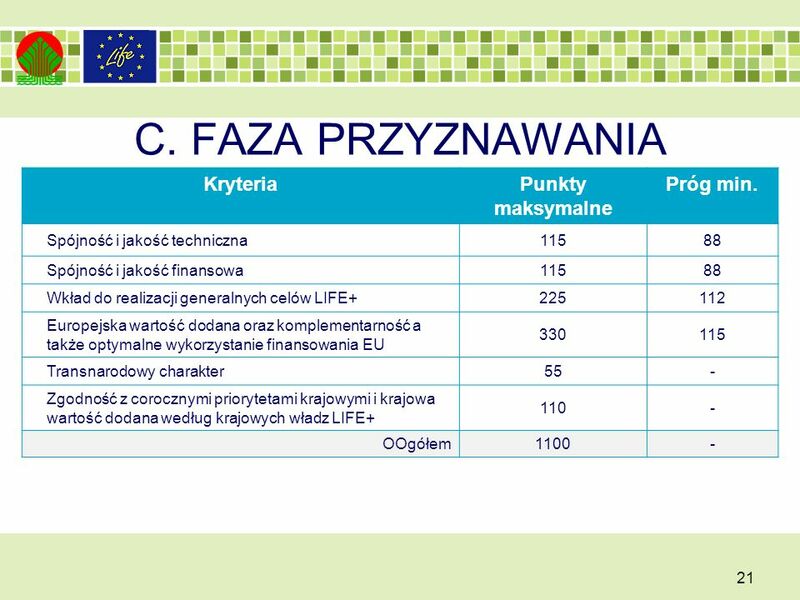 Spójność i jakość techniczna 115 88 Spójność i jakość finansowa Wkład do realizacji generalnych celów LIFE+ 225 112 Europejska wartość dodana oraz komplementarność a także optymalne wykorzystanie finansowania EU 330 Transnarodowy charakter 55 - Zgodność z corocznymi priorytetami krajowymi i krajowa wartość dodana według krajowych władz LIFE+ 110 OOgółem 1100 Points to make during the Presentation: All proposals that successfully pass the Selection phase, enter into the Award Phase. Here, proposals are scored according to six criteria with a maximum of 100 points in all. The first four of these criteria have thresholds, meaning that a proposal will be rejected if it scores below the threshold for one of these criteria. 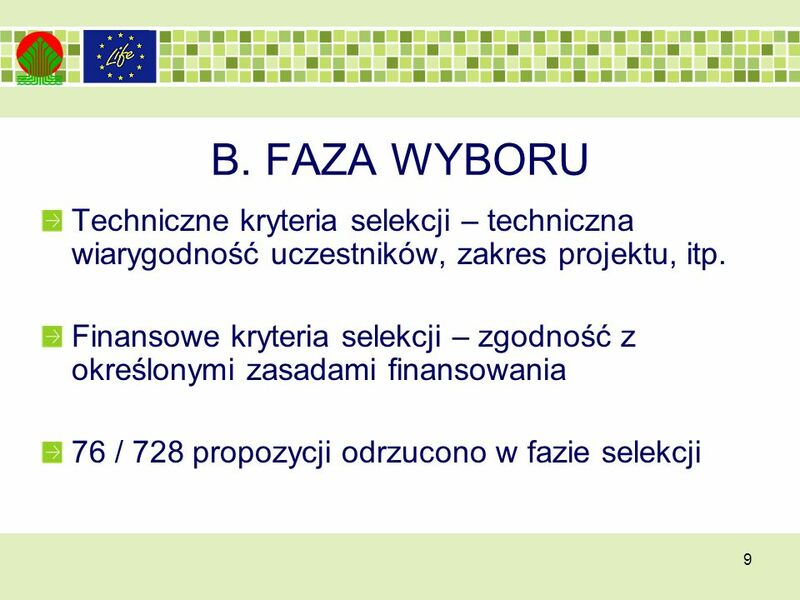 The criteria are as follows: Technical coherence and quality: clear, coherent, realistic and feasible in terms of actions, timetable, budget and value for money. Projects can gain a maximum of 15 points for this criterion; any project scoring below 8 will be rejected. 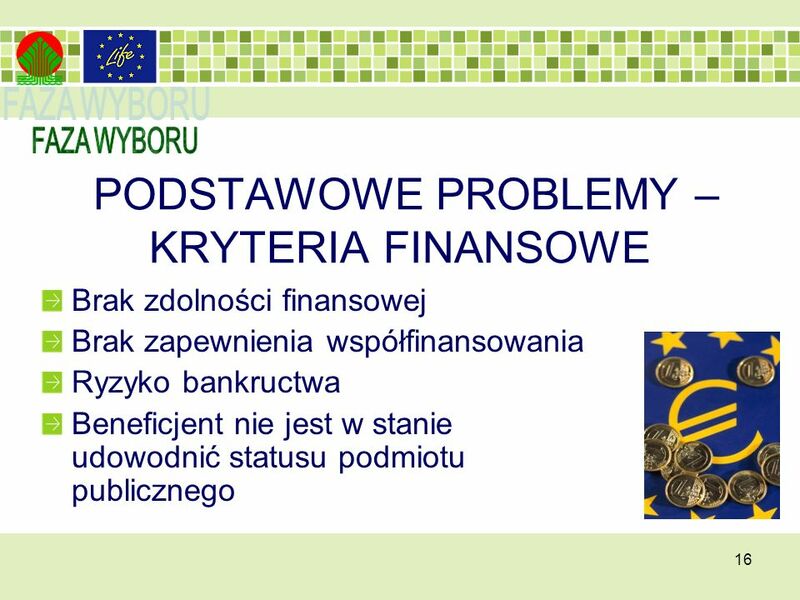 Financial coherence and quality: budget must be consistent with the technical actions; contribution and budget must comply with Regulation, etc. 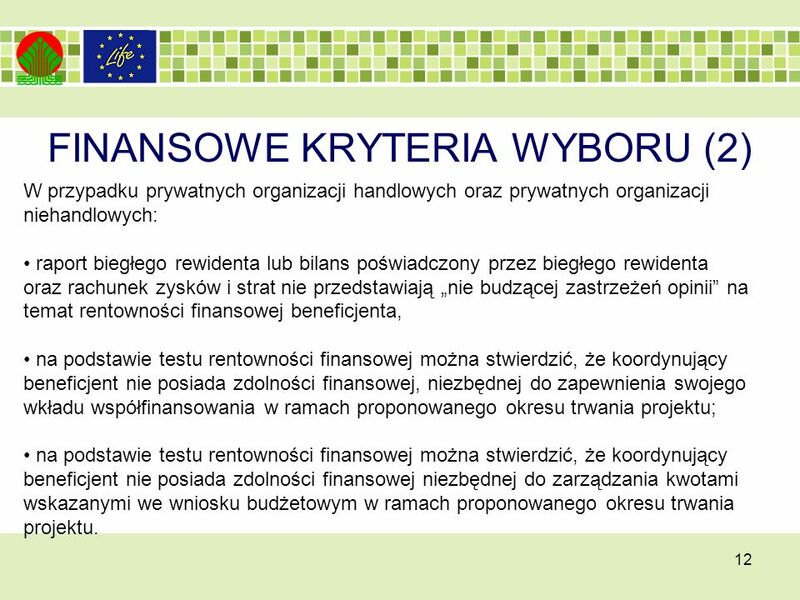 Transparent, coherent, cost-efficient and value for money. Projects can gain a maximum of 15 points for this criterion; any project scoring below 8 will be rejected. 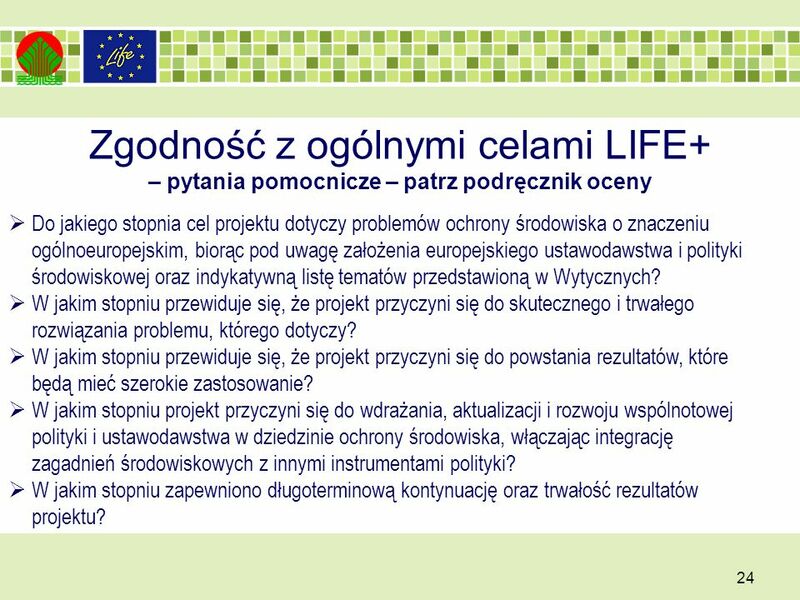 Contribution to the general objectives of LIFE+: If the problem is relatively important at European level, if the proposal is expected to make a significant contribution to solving the problem, and/or if the project is expected to generate findings that are widely applicable. 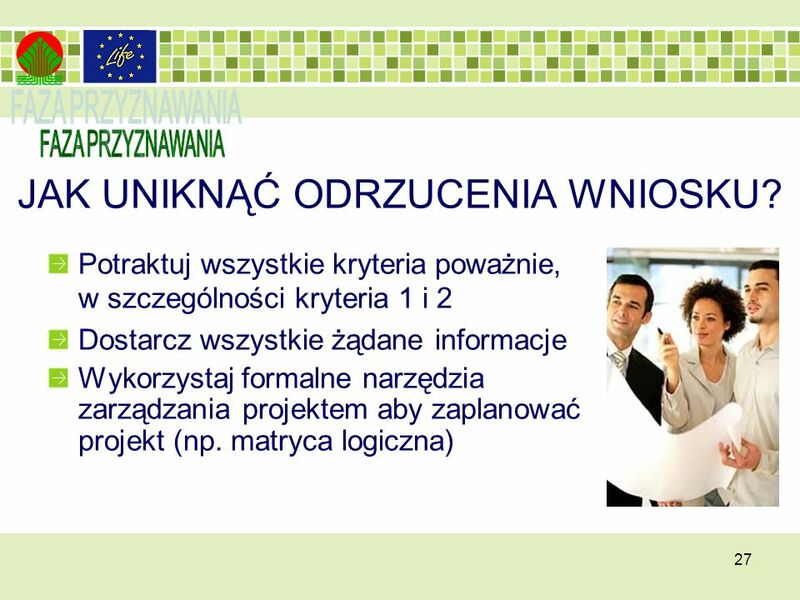 Projects can gain a maximum of 25 points for this criterion; any project scoring below 12 will be rejected. 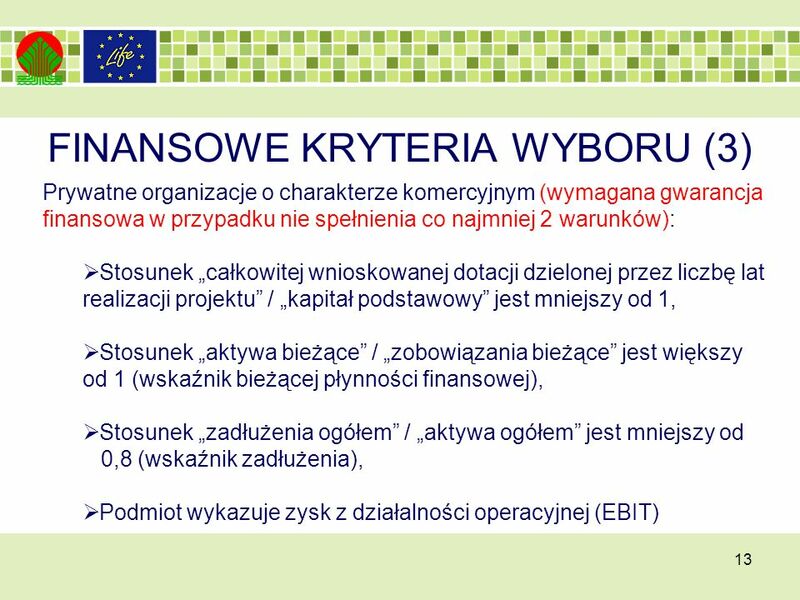 European added value and complementarity and optimal use of EU funding: projects will be examined according to, inter alia: Demonstration/innovation/best practice Lessons learned Stakeholder involvement Limiting carbon footprint Synergies with other instruments Projects can gain a maximum of 30 points for this criterion; any project scoring below 15 will be rejected. 5. Transnational character: Projects involving participants from more than one EU country can gain up to 5 additional points on this criterion. There is no minimum score so no proposal can be rejected on this criterion. 6. 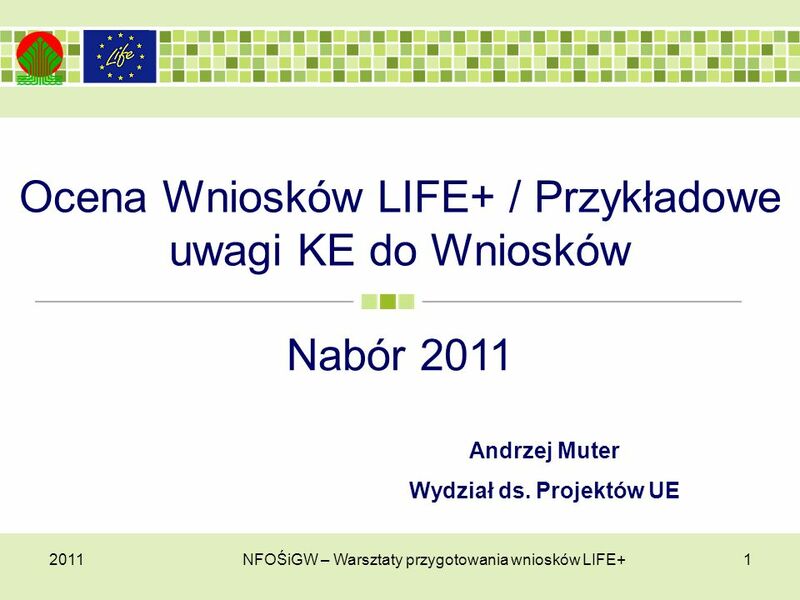 Compliance with national annual priorities and national added value according to LIFE+ national authority: Proposals can gain up to 10 additional points based on the assessment of the national authority. As explained earlier, the scoring under this criterion will only be used when comparing proposals within a country, not between countries. Again, there is no minimum score so no proposals can be rejected on the basis of this criterion. Additional points: Background information: Evaluation Guide: pp. 11 – 15. Detailed list: Evaluation Guide pp. 25 – 30. 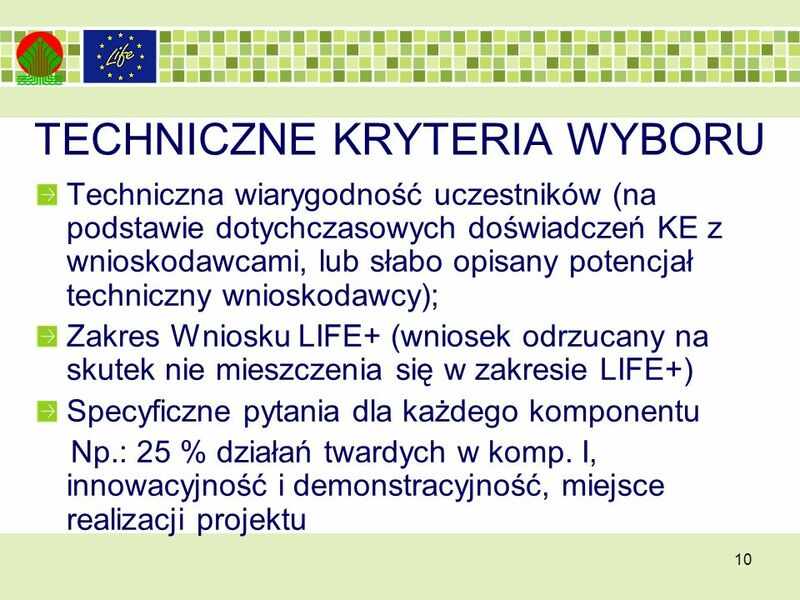 27 JAK UNIKNĄĆ ODRZUCENIA WNIOSKU? 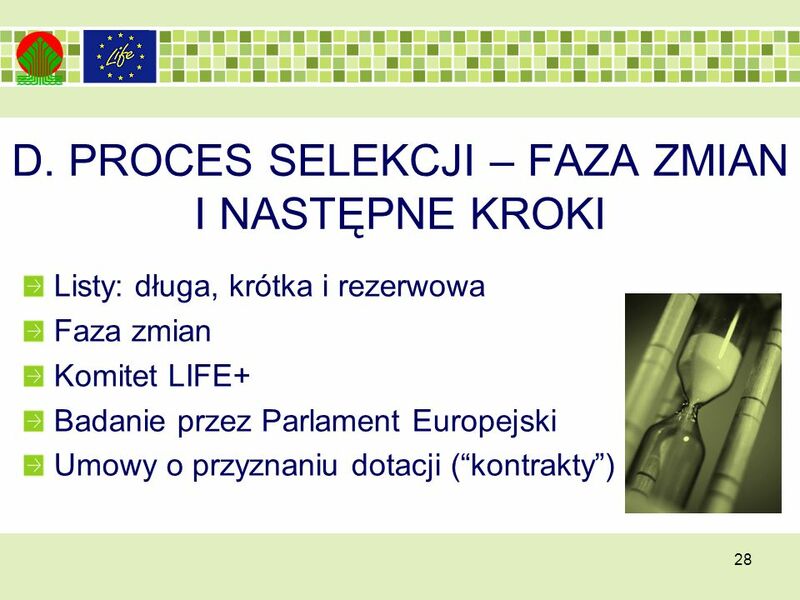 Listy: długa, krótka i rezerwowa Faza zmian Komitet LIFE+ Badanie przez Parlament Europejski Umowy o przyznaniu dotacji (“kontrakty”) Points to make during the Presentation: All proposals passing the Award Phase will be ranked depending on their respective scores. A “Long list” of proposals will be drawn up based on the results of the Award phase. 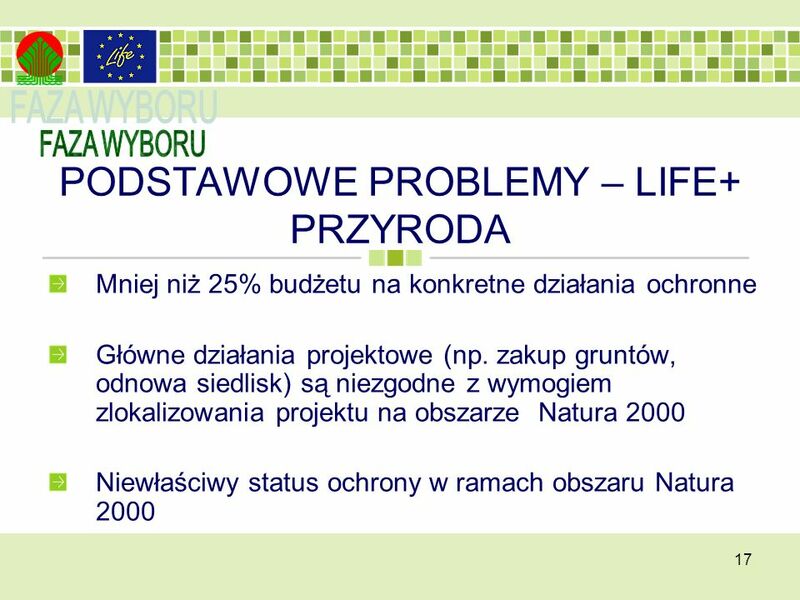 As well as the relative scores, this Long List must take into account that: 50% of LIFE+ budget must be allocated to nature and biodiversity projects; Projects must be distributed among the EU member states; and Ideally at least 15% of the budget should be allocated to transnational projects. The remaining projects are put on a Reserve list, and may be added to the Long List should a proposal fail to be brought into line with the LIFE+ requirements. The projects on the Long list enter the Revision phase, when applicants are asked to revise their proposals to bring them into line with LIFE+ requirements. 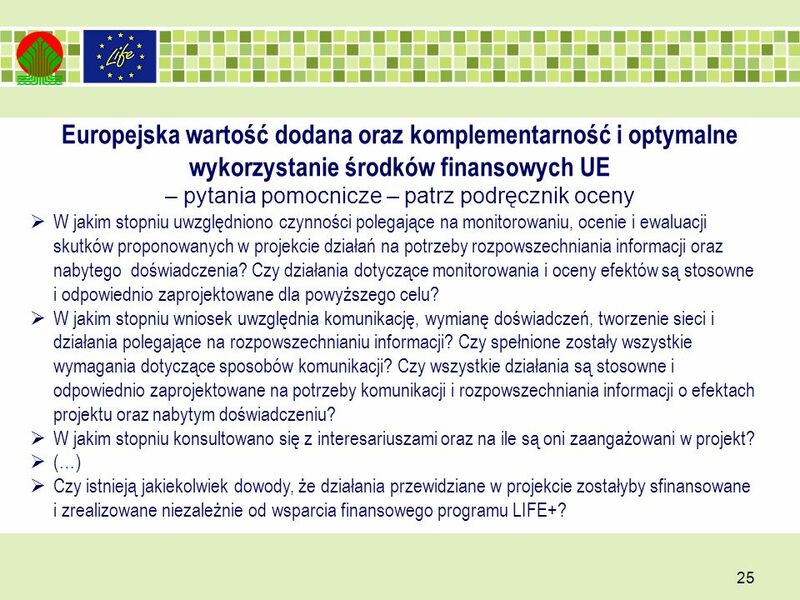 The aim of the revision phase is to ensure coherence among all proposals listed on the preliminary long and reserve lists, all open questions regarding feasibility, cost-effectiveness and eligibility of individual actions, compliance with the LIFE+ Regulation and Common Provisions, etc. 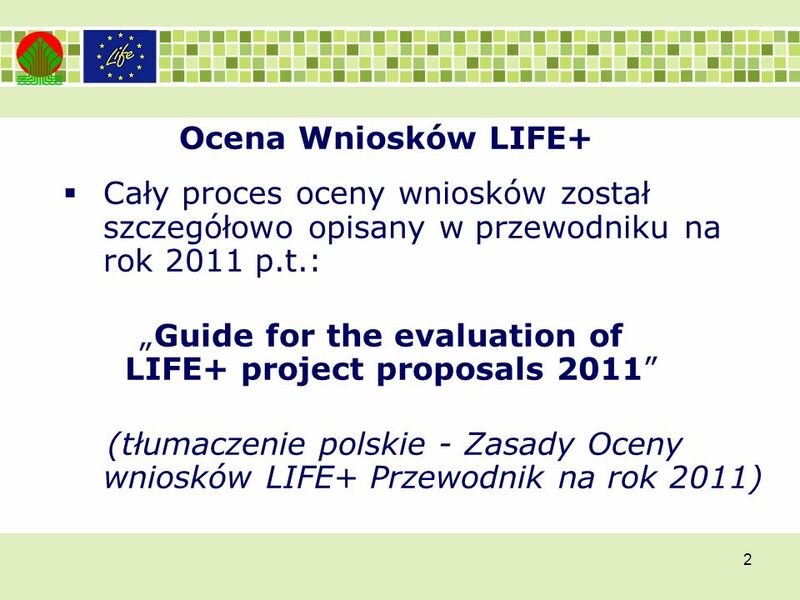 On the basis of this, a “Short list” is submitted to the LIFE+ Committee for its opinion of projects to be co-financed. The European Parliament must then scrutinise the Short List to ensure that the Commission has not exceeded its implementing powers. Then grant agreements are sent to each successful applicant. Additional points: Background information: Lists: Evaluation Guide pp. 16 – 18. Revision Phase: Evaluation Guide p. 19. 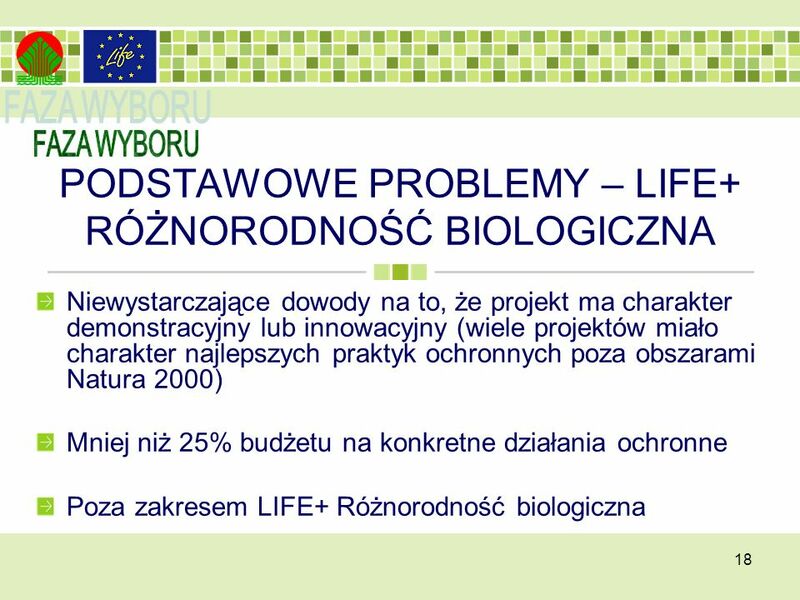 Pobierz ppt "Ocena Wniosków LIFE+ / Przykładowe uwagi KE do Wniosków"